Human rights describe moral norms or moral standards which are understood as inalienable fundamental rights of every human person. Human rights encompass a wide variety of rights including right to a fair trial, protection of the physical integrity, protection against enslavement, the right to free speech, the right to education. The protection of human rights is certainly one of the most important aspects of development. Unfortunately it receives much less attention than other aspects, presumably also because it is so very hard to measure. : If one is interested in empirically studying the protection of human rights it is not enough to count countries that ratify human rights treaties. Instead the quantitative study of human rights aims to capture whether or not certain human rights are protected in practice. The problem – ethically you want to increase the standards by which we assess human rights violations over time, but this poses a problem for measurement: One of the fundamental drivers to reach the aim of protecting human rights is the increasing recognition of the many dimensions in which individual rights are violated. It is therefore crucial to change the standards of human rights protection if you want to improve human rights protection. From an ethical perspective it makes sense to raise the standards of human right protections if your aim is to abolish more and more repressive practices by which governments abuse the human rights of their citizens. However, from a measurement perspective raising the standards by which we evaluate whether human rights are protected poses a problem. This is because changing the standards for what constitutes human rights violations makes it impossible to compare human rights protection over time. The solution – correct for changing standards of accountability: In a landmark paper – Fariss (2014)1 – the political scientist Christopher J. Fariss investigated whether the standards by which human rights organizatios measure the protection of human rights have indeed changed over time. Fariss’ assessment of the protection of human rights focusses on the protection of the physical integrity of citizens. He aims to measure how a government protects the physical integrity takes into account torture, government killing, political imprisonment, extrajudicial executions, mass killings and disappearances. To correct for the bias introduced by changing standards in the measurement of human rights protection Fariss developed the &apos;dynamic standard model’. With this model he adjusts for the bias in measurements so that human right protection measurements can be compared over time. Fariss uses available quantitative information on human rights violations and then employs statistical techniques to correct for the changing standards of human right protections. His empirical measures of human right protection are presented in the visualisation below. You can move the slider underneath the map to see the change over time and by switching to the Chart view you can see his assessment of human rights protection country by country over time. 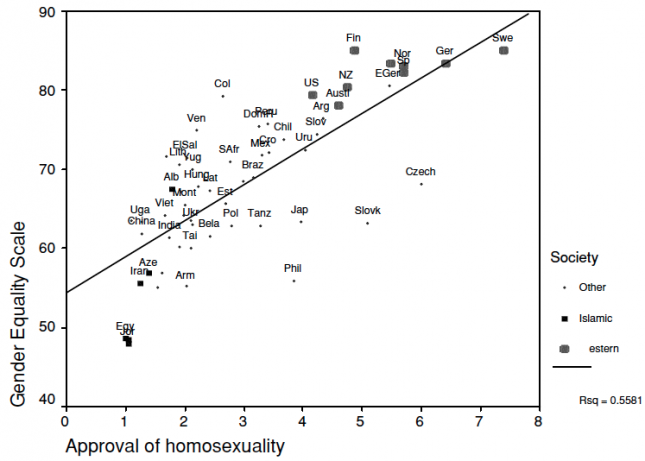 How to read this chart: Higher values – higher human rights scores – indicate better human rights protection. The human rights scores represent the relative position of one country in one year relative to the average across the entire time (1949-2014) of all countries: This means, a zero score represents the average level of observed physical integrity abuses for the entire period (1949-2014). The human rights scores represent standard deviations above and below zero; as can be seen the worst and best country-years fall 2 to 3 standard deviations below or above the average. Fariss research findings suggest that we saw no trend in human rights protection because at the same time as human right protection improved we also raised the standards by which we measure human right protection. Viewed in the Chart view this visualisation shows the human rights protection scores for each country over time. There is much less long-term data on the treatment of minorities than one would hope for. Records however do exist for the most extreme forms of violence such as lynchings. The first institution to record lynchings in the USA was the Tuskegee Institute, which is now Tuskegee University. 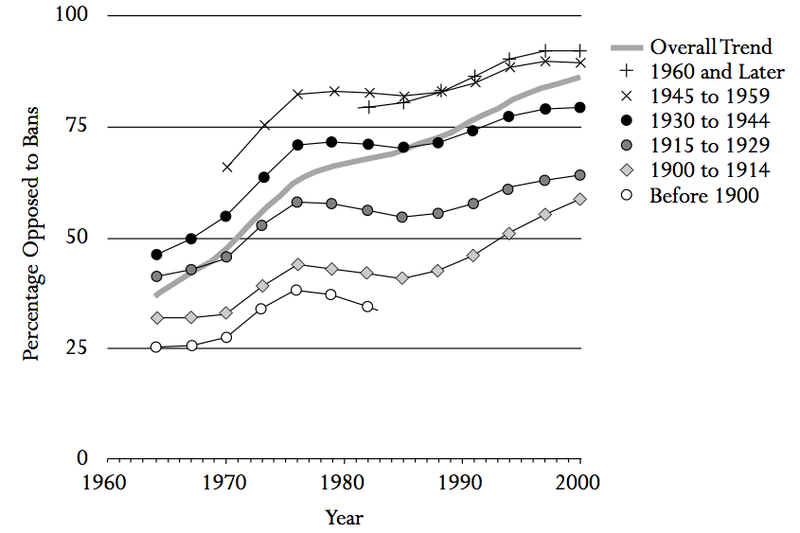 Their data is shown here (for other statistics on lynchings see Wikipedia). The data was also mapped by the Tuskegee Institute, and this US map of lynchings by states and counties in the United States from 1900 to 1931 is described by Slate Magazine here. The map below shows the share of women who have gone through partial or total removal of the female external genitalia or other injury to the female genital organs for cultural or other non-therapeutic reasons. Data is only available for African and Middle Eastern countries. Anti-miscegenation laws prohibited interracial marriages in a number of countries around the world; an overview is given here. The chart below plots the level of GDP per capita against the Human Rights Protection Score from Schnakenberg and Fariss. We see that more prosperous countries tend to protect human rights better. Some resource rich economies – Saudi-Arabia, Kuwait, Equatorial-Guinea and others – are outliers which are both rich and have low human rights protection scores. 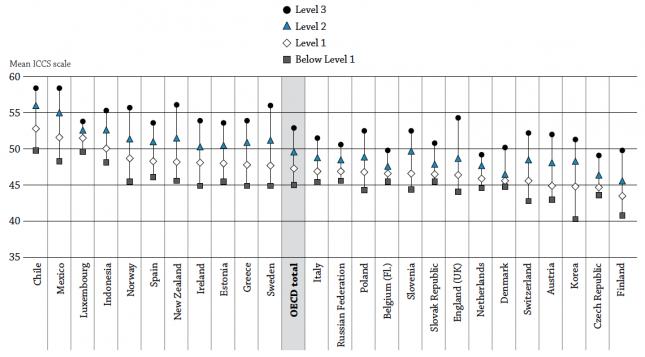 The countries with the lowest human rights protection scores are also poor economies. Data: This assessment of the protection of human rights focusses on the protection of the physical integrity of citizens. He aims to measure how a government protects the physical integrity takes into account torture, government killing, political imprisonment, extrajudicial executions, mass killings and disappearances. produced by Christopher Farris and Keith Schnakenberg. Published in: Christopher J. Fariss. 2014. Respect for Human Rights has Improved Over Time: Modeling the Changing Standard of Accountability. American Political Science Review 108(2):297-318 (May 2014).- Supplementary Materials: Keith Schnakenberg and Christopher J. Fariss. 2014. Dynamic Patterns of Human Rights Practices. Political Science Research and Methods 2(1):1-31 (April 2014). The Minorities at Risk project tracks 283 politically active ethnic groups throughout the world from 1945 to the present. The website is here. This visualization is based on data from the Tuskegee Institute, which is made available by the University of Missouri - Kansas City here. 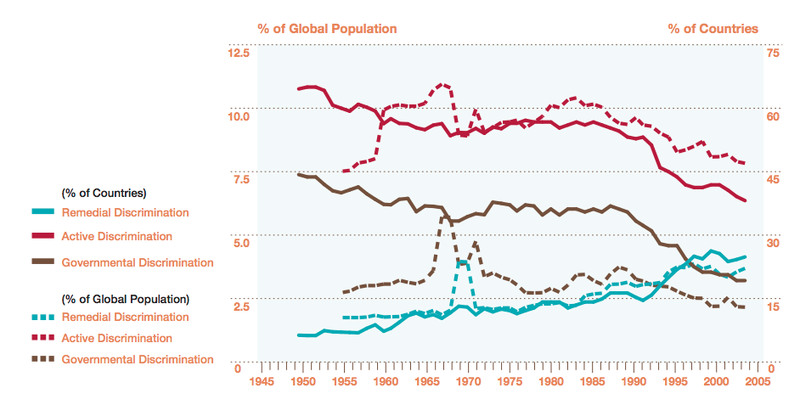 The source for this graph is Pinker (2011) - A History of Violence Edge Master Class 2011 published online at Edge here. It is also figure 7-6 in the same author's book: Pinker (2011) - The Better Angels of Our Nature: Why Violence Has Declined. Viking Adult. The data source for “separate schools” is Schuman, Steeh, & Bobo, 1997, originally gathered by the National Opinion Research Center, University of Chicago. The data source for “would move” is also from Schuman, Steeh, & Bobo, 1997, originally gathered by the Gallup Organization. The source of this map is Wikipedia here. The legend is originally separate and I have included it in the map. 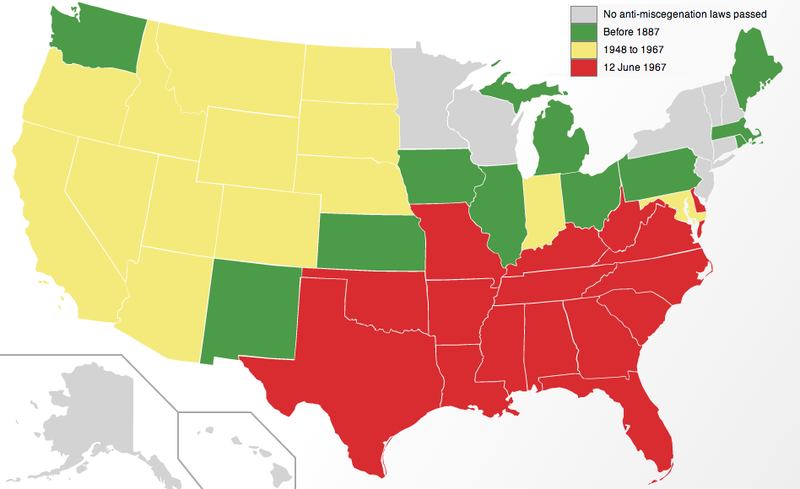 Anti-miscegenation laws were laws that enforced racial segregation for marriage and intimate relationships and are described in Wikipedia here. The graph is taken from Pew Research here. 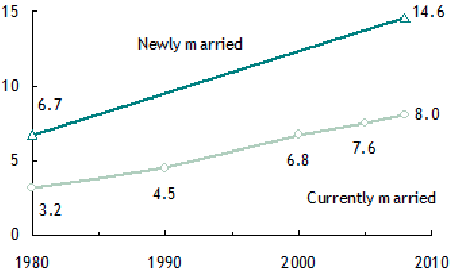 Newly married numbers were taken from the 1980 Census and 2008 American Community Survey (ACS). Currently married numbers are from 2005 and 2008 ACS and US Decennial Census data, based on Integrated Public-Use Microdata Series (IPUMS) series. 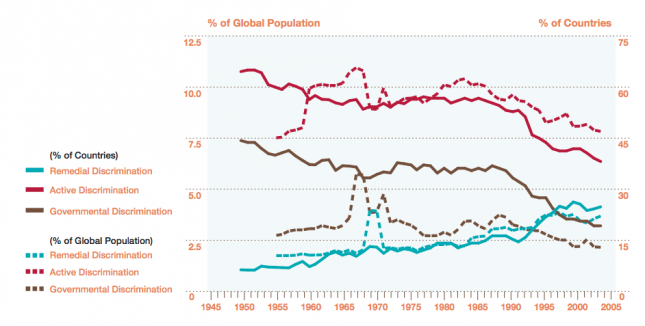 The source of this is Gallup (July 25, 2013) and it is online here. 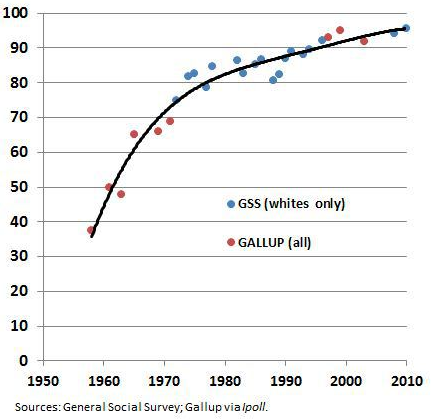 1958 wording "...marriages between white and colored people"
1968-1978 wording "...marriages between whites and nonwhites"
Trend from 1968-2003 includes Hispanics; trend from 2004-2013 is for non-Hispanic whites only. 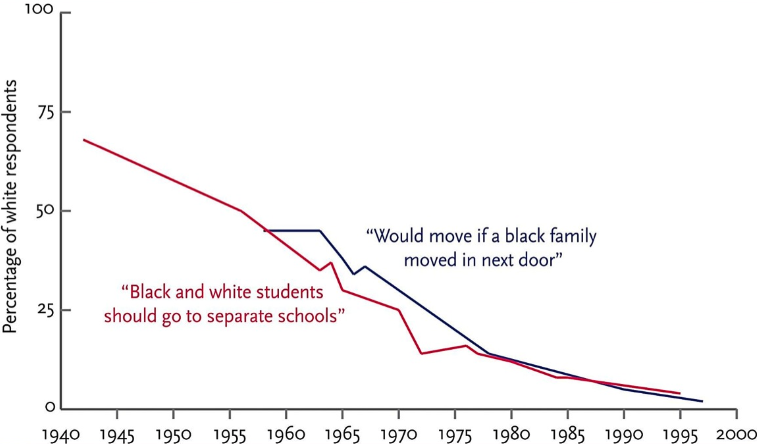 The source of this is Fischer and Hout (2008) - Century of Difference - How America Changed in the Last One Hundred Years, Russell Sage Foundation. The website of the book is here. Tables and figures are online here. The original data sources are NORC and GSS. The graph is taken from online Claude Fischer's article Obama’s racial penalty at the website of the University of Berkeley. The source is Marshall and Gurr (2005) - Peace and Conflict 2005 - A Global Survey of Armed Conﬂicts, Self-Determination Movements, and Democracy. The main authors are Monty G. Marshall and Ted Robert Gurr. Contributors are Victor Asal, Barbara Harff, Deepa Khosla, and Amy Pate. The data shown is the mean ICCS scale of “support for equal rights for ethnic minorities” among grade 8 students. students’ responses to a series of questions related to attitudes towards minorities’ rights. The questions ask if students express support for equal rights for all ethnic groups. These scales are set to have an international mean of 50 scale points and a standard deviation of 10 points. See Lauglo (2011) for more details on how this scale is developed. - Lauglo, J. 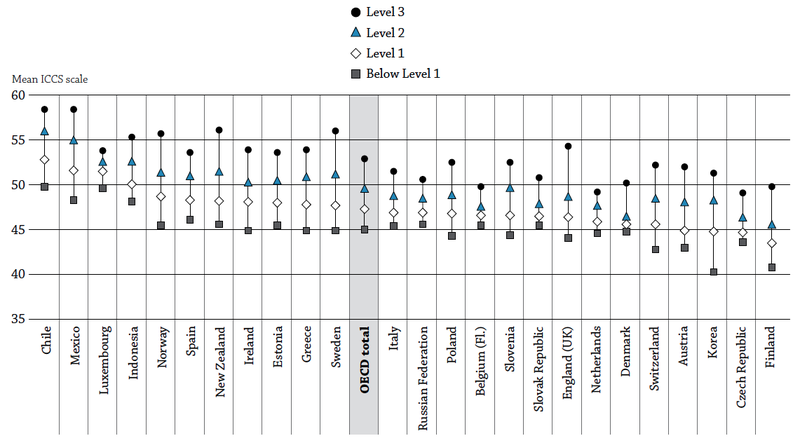 (2011), Statistics of Possible Interest to OECD Based on Data from the IEA International Civic and Citizenship Education Study 2009, unpublished mimeo, Norwegian Social Research (NOVA), Oslo. Civic knowledge means knowing about and understanding elements and concepts of citizenship, as well as those of traditional civics (Schultz, et al., 2010). The ICCS assessment is based on a 79-item test administered to lower-secondary students (8th grade) and covers issues related to civic society and systems, civic principles, civic participation and civic identities. Three-quarters of the test items involve reasoning and analysis associated with civics and citizenship, while the rest focuses on knowledge about civics and citizenship. Civic knowledge is measured on a scale with an international average of 500 points and a standard deviation of 100. There is significant variation across and within countries in civic knowledge: half of the total variance in civic knowledge was found to be at the student level, a quarter at the school level, and a quarter across countries. See Schulz, et al. (2010) for more details on how civic knowledge is conceptualised. - Schulz, et al., (2010), ICCS 2009 International Report: Civic Knowledge, Attitudes, and Engagement Among LowerSecondary School Students in 38 countries, IEA, Amsterdam. The source of this graph is Google Ngram. Google has digitalised 5.2 million books, published between 1500 and 2008, containing 500 billion words (according to Wikipedia). Google Ngram lets you calculate how often a particular word or phrase occurs among all words in all books in any given years and shows these frequencies in a plot. The Google Ngram is explained by Google here. This is the link to the Google Ngram I have shown here as a screenshot. The idea for this Ngram is taken from figure 7-1 in Pinker (2011) - The Better Angels of Our Nature: Why Violence Has Declined. Viking Adult. 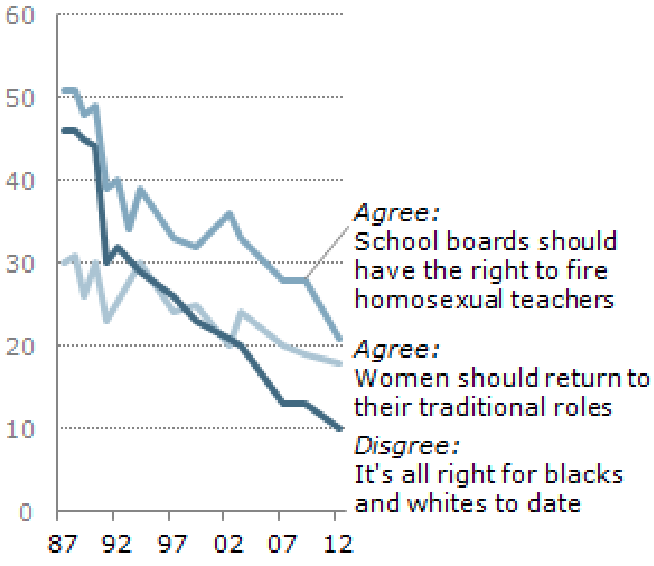 This graph is taken from the website of Pew Research here. The source is Norris and Inglehart (2004) - Sacred and Secular: Religion and Politics Worldwide. Cambridge University Press. The data sources are the World Values Survey & the European Values Survey.